Legendary oceanographer Dirk Pitt must work with his children to unravel old battle plans from WWII to prevent a present-day massacre in this novel in the #1 New York Times-bestselling adventure series. In the waning days of World War II, the Japanese tried a last desperate measure. Kept secret from all but a few select officials, two submarines were sent to the West Coast of the United States, their cargo a revolutionary new strain of biological virus, their mission to unleash hell. Neither sub made it to the designated target.But that does not mean they were lost. Someone knows about the subs and what they carried, knows too where they might be, and has an extraordinary plan in mind for the prize inside—a plan that could reshape America, and the world, as we know it. All that stands in the way are three people: a marine biologist named Summer, a marine engineer named Dirk . . . and their father, Dirk Pitt, the new head of NUMA. Pitt has faced devastating enemies before, has even teamed up with his children to track them down. But never before has he encountered such pure evil—until now. Really good read for the car. Narrator is fantastic. Just like every other one of these books. World in danger. Siblings save it. Really makes you think!! What is going on that we have no way of knowing about. Well read! As a Cussler fan, I say that this is the fun reading/listening stuff that Clive writes. Though it is always far reaching in plot, it is enjoyable. I enjoyed this story. I wouldn't say it was my favorite of all time but it was entertaining nonetheless. The Cusslers win the prize for the highest rate of dangling participles ever amassed to slow understanding of a work of fiction. If that doesn't bother you, the story is another dependable cliff-hanger. I liked this book very much. I was surprised that Dirk Pitt has twins. Clive Cussler's books are always a pleasure for me to read and or listen to. Looks like Dirk Jr. is following right in dear old dad's footsteps in saving the world. I'm glad I listened to the abridged version. This one still went into a little too much detail for me but it was true to form Cussler. I enjoyed it. Black Wind is a great action, adventure novel. The narrator was excellent. The interweaving of the major story lines was ingenious. My only criticism is that after a while, it was pretty ridiculous how many times they survived "certain death". On a side note, Clive Cussler makes a small appearance in the book. I thought that this book started out pretty slow but after the first disc it picked up and turned into a good book. 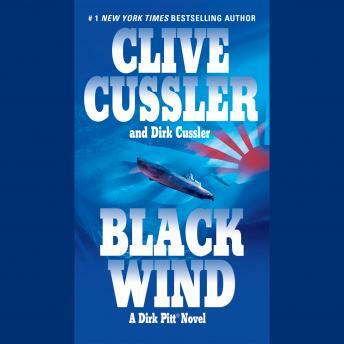 I didn't think it was one of Clive Cussler's best but I would still recommend it.